All buttons, Android events, and behavior guidelines are the same for all remotes — with the exception of the voice search (microphone) button, which is only available on some remotes. For suggested guidelines on button behavior for all supported controllers, see Controller Behavior Guidelines. For information on handling input from the Amazon Fire Game Controller, see Amazon Fire Game Controller Input. The Amazon Fire TV platform supports user input from the Amazon Fire TV Remote, the Fire TV Voice Remote, the Fire game controller, and other game controllers that support the Bluetooth HID gamepad profile. All controllers must be paired with the device to be used. All the Amazon Fire TV controllers are Android input devices. You use the same techniques and APIs to manage input from those devices as you would any other Android input device. In particular, simple input from any controller such as navigation or selection can be managed through key events in the same way you would handle input from a keyboard or a button pad. Most Amazon Fire TV remote controls have these buttons. 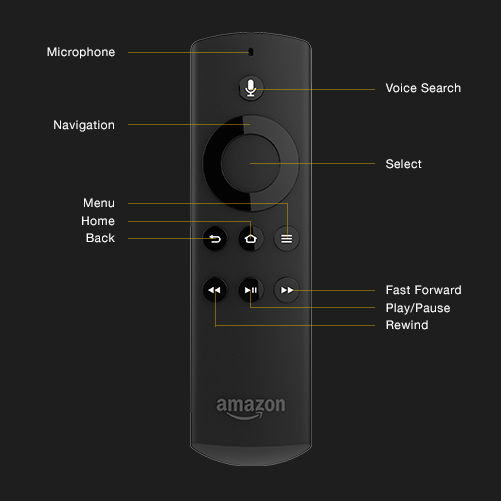 Some Fire TV remotes do not include the microphone (voice search) button. The remote controllers for Fire TV Edition has some additional buttons — such as volume up/down, power, Netflix, Amazon Prime, and other apps. However, these buttons can't be mapped to events in third-party apps, so the buttons shown in the above Fire TV remote are effectively the same available buttons for Fire TV Edition remote controllers, even if the remotes look a bit different. All Amazon Fire TV remote controls generate KeyEvent events for button presses, as any Android input device does. You can handle controller button input with standard Android event listener interfaces and callbacks (onClick(), onFocusChange(), and so on). Neither the Amazon Fire TV Remote nor the Voice Remote raises motion events (from the Android MotionEvent class). To capture specific button press events in your View, override input event handlers such as onKeyDown(). Test for the input constants from the KeyEvent class to capture specific keys. As with all input events, your listener method should return true to capture the event and handle it, or pass that event on to super.onKeyDown() so that other controls can manage it. The following table describes the buttons, the Android KeyEvent constants, and the default behavior of those buttons. None of the Amazon Fire TV remotes raises motion events (from the Android MotionEvent class). If you do not capture a specific input event the default behavior occurs. Home none Return the user to the Home screen. This is a system event and cannot be intercepted. Back KEYCODE_BACK Return the user to the previous operation or screen (Activity). Menu KEYCODE_MENU Invoke the Android context menu (OptionsMenu). Microphone (Search) (Voice Remote only) none Invoke the system voice search. This is a system event and cannot be intercepted. Select (D-Pad Center) KEYCODE_DPAD_CENTER Select the user interface item with the current focus. Up (D-Pad) KEYCODE_DPAD_UP Move the focus upward in the user interface. Down (D-Pad) KEYCODE_DPAD_DOWN Move the focus downward in the user interface. Left (D-Pad) KEYCODE_DPAD_LEFT Move the focus left in the user interface. Right (D-Pad) KEYCODE_DPAD_RIGHT Move the focus right in the user interface. Play/Pause KEYCODE_MEDIA_PLAY_PAUSE Control media playback. Play/Pause is a toggle. Rewind KEYCODE_MEDIA_REWIND Rewind or skip backwards in media playback contexts. Fast Forward KEYCODE_MEDIA_FAST_FORWARD Fast Forward or skip ahead in media playback contexts.